Combo package of our three "Minimum-Diameter" scale Mini-Engine kits: D - Region Tomahawk, IQSY Tomahawk and Sandia Sandhawk. These kits has been newly updated and now come with laser-cut fins, water-slide decals and completely re-written and updated instructions! See the specs on each kit below. The D - Region Tomahawk was flown early in 1968. This vehicle was intended to fly to the D layer of the ionosphere, thus the name "D - Region". Tomahawk rockets are used to this day as the upper stage of many sounding rocket flights. The D - Region Tomahawk has long been a favorite of scale modelers. This minimum-diameter "Peanut Scale"
kit flies on 13 mm "mini" engines and features basswood fins, balsa nose cone, decals, and streamer recovery. Adhesive (A wood glue, such as Elmer's Carpenters Glue or Titebond can be used for most steps and is recommended. Cyanoacrylate or epoxy may be used throughout if you are familiar with their use); hobby knife with a sharp #11 blade; straight edge (preferably metal); scissors; masking tape; scotch tape; sanding sealer (or balsa fillercoat); thinner (appropriate type for the sanding sealer); small paint brush; paint (Spray paint, such as Krylon or Testors is recommended. Be sure not to mix different types or brands of paint without testing. ) - primer (optional), flat white, flat black, aluminum (note: silver may be used in place of the aluminum ), flat red, flat brown & flat clear (optional); sandpaper (medium - 220 or 280, fine - 320 or 400, & [optionally] extra fine - 500 or 600); ball point pen; pencil.
) Tomahawk was flown in 1963. Four single stage flights took place between 1963 and 1964. The Tomahawk served as the upper stage of many Nike Tomahawk flights during the International Quiet Sun Year of 1964 - 1965. The IQSY Tomahawk has long been a favorite subject for scale modelers. 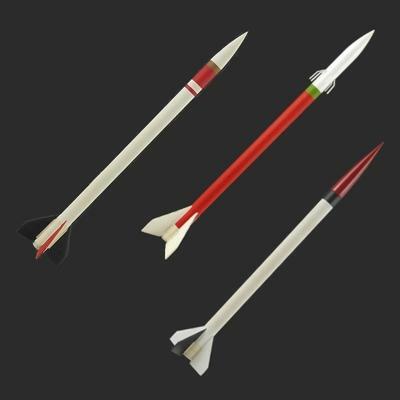 This minimum-diameter "Peanut Scale"
kit features basswood fins, balsa nose cone and decals. A bright plastic streamer brings the model back to earth for repeated missions. Adhesive (A wood glue, such as Elmer's Carpenters Glue or Titebond can be used for most steps and is recommended. Cyanoacrylate or epoxy may be used throughout if you are familiar with their use); hobby knife with a sharp #11 blade; straight edge (preferably metal); scissors; masking tape; scotch tape; sanding sealer (or balsa fillercoat); thinner (appropriate type for the sanding sealer); small paint brush; paint (Spray paint, such as Krylon or Testors is recommended. Be sure not to mix different types or brands of paint without testing. ) - primer (optional), flat white, flat black, red, & flat clear (optional); sandpaper (medium - 220 or 280, fine - 320 or 400, & [optionally] extra fine - 500 or 600); ball point pen; pencil. Our most popular "Peanut Scale" model features basswood fins, balsa nose cone, wire antennas & decals. This great looking minimum-diameter model flies on mini A engines. Adhesive (A wood glue, such as Elmer's Carpenters Glue or Titebond can be used for most steps and is recommended. Epoxy is needed for one step, Cyanoacrylate or epoxy may be used throughout if you are familiar with their use); hobby knife with a sharp #11 blade; straight edge (preferably metal); scissors; pliers (needle nose preferred); masking tape; scotch tape; sanding sealer (or balsa fillercoat); thinner (appropriate type for the sanding sealer); small paint brush; paint (Spray paint, such as Krylon or Testors is recommended. Be sure not to mix different types or brands of paint without testing. ) - primer (optional), flat white, gloss white, steel (note: silver may be used in place of the steel), flat red, metallic green & clear (flat and/or gloss, optional); sandpaper (medium - 220 or 280, fine - 320 or 400, & [optionally] extra fine - 500 or 600); ball point pen; pencil; small straight pin. Optional: 3/64" gray trim tape; 3/64" black trim tape; material to fill body tube seams such as Elmer‘s Fill & Finish, Elmer‘s Professional Carpenter‘s Wood Filler or interior spackling paste. Electronic launch system; launch pad with 1/8" launch rod; recovery wadding; engines (see lists of recommended engines above).